I never really thought this would be the case, but since the little is on the brink of walking any day now (she is toddling around behind her little push cart all the time) I've been looking for soft soled shoes. And honestly? Most of the little girl options are pretty "meh" for me. They either have butterflies or princesses or ribbons all over them, or look like they're fashioned for the geriatric set. 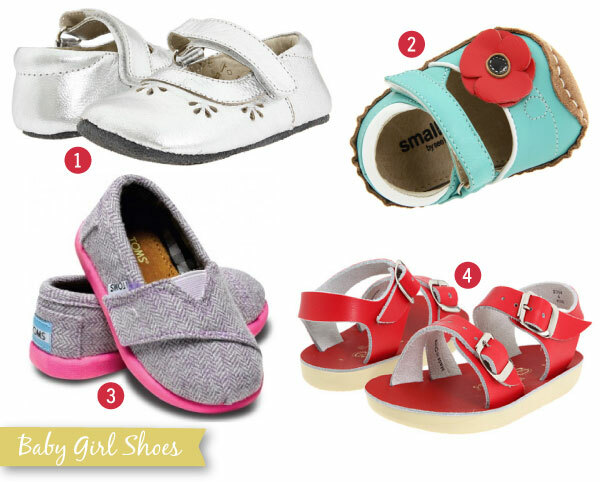 So after some online searching...admittedly, there are worse things than spending my evenings on the hunt for baby shoes...I found these four options that are definitely my favorites. In case any of you are in the same boat, I thought I would share! Gah! All of these are ridiculously adorable! My daughter wants to learn crossfit. Can anyone suggest me some brand names for best shoes for crossfit for children!It will be an kind honor to get feedback.